Added to the list of Saints in 1929/30 e.v. Spanish-born Rodric Borgia (born Rodrigo Lanzol, later adopting his mother’s family name of Borja, italianized as Borgia) is remembered by Catholics as one of the most “decadent” of the Renaissance Popes. 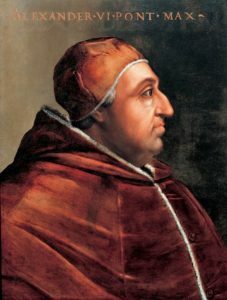 Alexander VI was in fact a popular Pope during his day: he was a patron of the arts and a political statesman, who repelled a French attempt to assert control over Italy, liberated the Papal States from petty land barons, called for a league of Christian States against the Turks and was tolerant toward the Jews. He was also partial to the Qabalah, and he granted absolution to Giovanni Pico della Mirandola, a Christian Qabalist and student of Raymond Lully and Marcilio Ficino, who had been accused of heresy by the Inquisition under Pope Innocent VIII. Michelangelo created the Pietà for Alexander. He had over seven children, including Lucrezia, famous as a patroness of the arts, and the notorious Cesare (who became the model for Machiavelli’s “The Prince”) whom he fathered by his Roman mistress Vannozza dei Catenei. He deeply loved his children, and became embroiled in political turmoil over his attempts to endow them with land and power. This, in combination with his involvement in the struggles between the Orsini, della Rovere and Collona families, his penchant for grandeur, and a comparatively libertine lifestyle have resulted in his current reputation. Alexander VI certainly deserves some of the blame or credit for inspiring the German reformation (see Ulrich von Hutten). Crowley considered Borgia to be one of his previous incarnations (along with Eliphas Lévi, Cagliostro, Edward Kelly, the Roman Marius de Aquila, Ko Hsuen (a disciple of Lao Tzu) and, of course, Ankh-af-na-Khonsu). In Chapter 86 of his “Confessions,” Crowley states that his task as Borgia, as appointed by the “Council of Masters,” was to crown the Renaissance. He notes that his failure at this task was due to “not being wholly purified” in his personal character.